Learn how to decipher the packaging of bacon and what to look for when buying it. Also, tips for how to store bacon in the fridge and freezer for later. I taught the American Girl: Back to School Lunch themed Junior Chef’s class at Williams-Sonoma in September, and one of the sandwiches we made was a B.L.A.T (Bacon, lettuce, avocado, and tomato). I had four superbly mannered and lovely young girls attend the class (American Girl dolls in tow – I should have brought mine! ), who jumped for joy when the saw the bacon on the counter. One young lady ended up taking home a sandwich that was only bread and bacon – forgoing all the other ingredients and asking for extra of the one that mattered most! I decided to tell these girls a story all about how when I got married, my husband Trever, did not eat bacon. The look of utter shock and disgust on their face was AMAZING! One of them said to me, “How could you not like bacon?!?! He must be crazy!” (complete with hand motions and eye rolling) to which all the other young ladies agreed fervently. While I can vouch that Trever is indeed not crazy (most days), I have won him over to my side and he enjoys eating it now – and even requests it on occasion. As bacon has become more trendy the last few years, the bacon section of the grocery has become even more overloaded with options. How do you know which one to choose? Let’s take a look at the major things to consider before purchasing. Back: Also known as Canadian bacon, this bacon comes from the middle of the loin – which is found on the back of the pig. This bacon is usually very lean, cut into round slices, and resembles ham. Middle: Middle bacon comes from the middle of the pig and tends to have a moderate amount of fat and flavor. 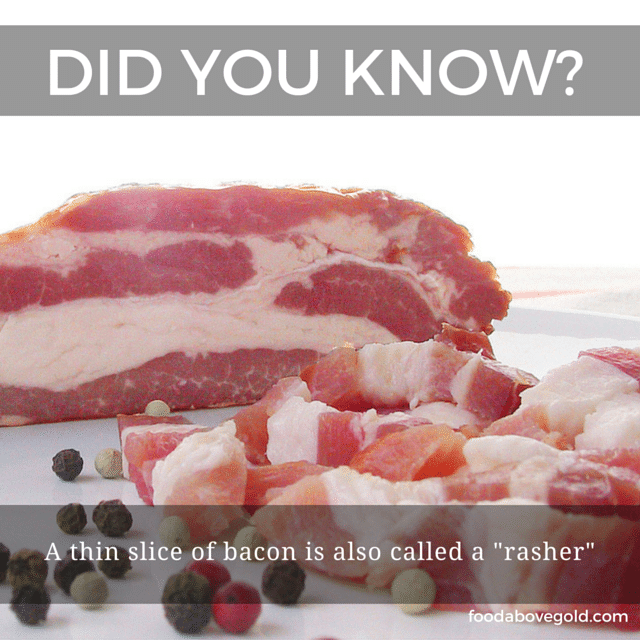 Side: Also referred to as “streaky” or “standard”, this is the bacon most of us buy at the grocery. It is usually very fatty, with obvious streaks of fat running in line with the rind. This bacon comes from the belly of the pig. Pancetta (the Italian version) also comes from the pork belly but is rolled and sliced extra thin before selling. Slab: This is usually made from where the belly meets the side – making for a slightly leaner cut than side bacon. Jowl: This is made from the cured and smoked neck of the pig. It is usually very fatty – so it makes for a great cut to throw in when braising, or to fry at the beginning when rendering fat. Cottage: You’re less likely to find this one, but it is made from the shoulder of the pig, so it is quite lean. It is usually cured and cut into thin, oval slices for baking or frying. Thickness. This is how thick or thin the meat is cut. Regular: If the package does not specify a type of cut, this is going to be what it is. 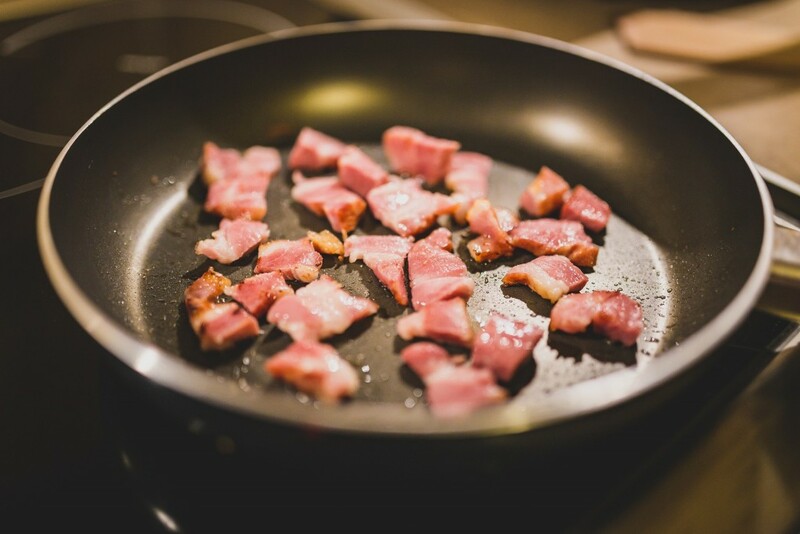 Regular (or standard) cut bacon is about 1/16″ thick, usually has around 16 slices per pound, and is great for just about anything – from frying to flavor chowder. 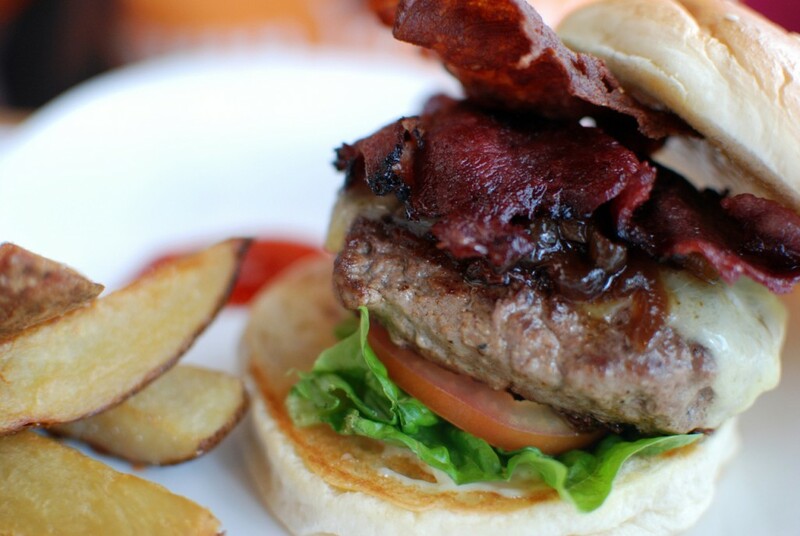 If you want to make bacon a showpiece in what you are cooking however, his is probably not the one for you. Thick-cut: This one is about 1/8″ thick (about 12 slices per pound) and is great for when you want the bacon to take center stage; like in pasta or on pizza. This one is sturdier, so it doesn’t lose it’s shape as easily as the regular thickness. Thin: This one is 1/32″ thick with roughly 30 slices per pound. Thin sliced is great for if you want to show off a nice layer of bacon while leaving it whole. Cured vs. Uncured. Curing is what differentiates bacon from plain raw pork belly (or whatever cut you choose). Cured: Curing is the process of injecting sugar, salt, nitrites, and phosphates into the meat to create an appealing color and a basic “bacon-y” flavor. Usually, one of 3 types of cures used: sugar, sugar-free, or maple (which uses maple syrup instead of sugar). If the type of cure is not specified – that means they probably used the standard sugar cure. Dry-cured or Dry-rubbed. This is a lengthy process (think weeks or months) that involves rubbing the ingredients on the outside of the meat instead of injecting it (which takes minutes). Because it takes months to cure the meat this is usually the most expensive option. Also, dry-rubbed bacon tends to be saltier and less wet than it’s injected counterpart. Smoking. How bacon is smoked it what gives it it’s own specific flavor. Some companies shorten the time by using injected liquid smoke instead of using an actual smoker. Natural or Hardwood: If you see this on the packaging, then you know that your meat went through an actual smoker instead of having liquid smoke injected. Applewood, Mesquite, or Hickory: Hickory is the most common type of wood used in smoking. Most likely if your package doesn’t say what kind of smoke it has to it, it’s probably hickory. Applewood and mesquite are the more prized flavors, however, it always comes down to preference. Note: The cut of meat at the neck of the pig is sometimes referred to as the “cheek”. This is different from the section of meat under the hollow of the eyes – which is much leaner. Double check with your butcher if you have any questions about which part you are getting. Whether you got lucky and found it on a deep discount, have just a little more than you needed, or are stocking up for later, make sure you have your bacon stored safely to protect it for as long as you need. Whole Package. A whole, unopened package will keep in the refrigerator until the use-by date, which is usually a week to a month from the purchase date. If you would like to freeze it, you’ll want to the protect the package because the bacon is usually surrounded by a small amount of liquid that can cause freezer burn. Wrap the package tightly and thoroughly with aluminum foil or plastic wrap before freezing. Opened Package. If you’ve opened a package and only used a few pieces you can keep the rest of your bacon stored in the refrigerator in a air-tight container (or wrapped tightly with plastic wrap) for around 4 days. Freeze strips of bacon for individual use by rolling up each slice seperately and placing them an inch apart on a sheet pan. Freeze them overnight and then transfer them to an air-tight container and remove each strip as needed. Stacks. If you’ve purchased your bacon from the deli counter or cut it yourself, it usually comes in a tall stack instead of fanned out like in the standard packaging. Stacks will keep in the refrigerator for 7-10 days after you have purchased it and stores best by wrapping it tightly in plastic wrap and keeping it in an air-tight container. You can do the same process for freezing it, and then when you are ready to use it, you can unwrap it and cut off just what you need for your recipe, re-wrap it, and place it back in the freezer. This is great for soups, homemade bacon bits, or pastas. Grease. If you are in a southern mood and want to save your rendered fat for later use (and who wouldn’t?!?!) then you’ll want to store your grease into an air-tight glass or ceramic container (but never plastic!) for later use. The left behind bits of meat are what will go rancid, causing your grease to spoil, so as long as you strain those out, you should be able to store your grease in the fridge indefinitely. 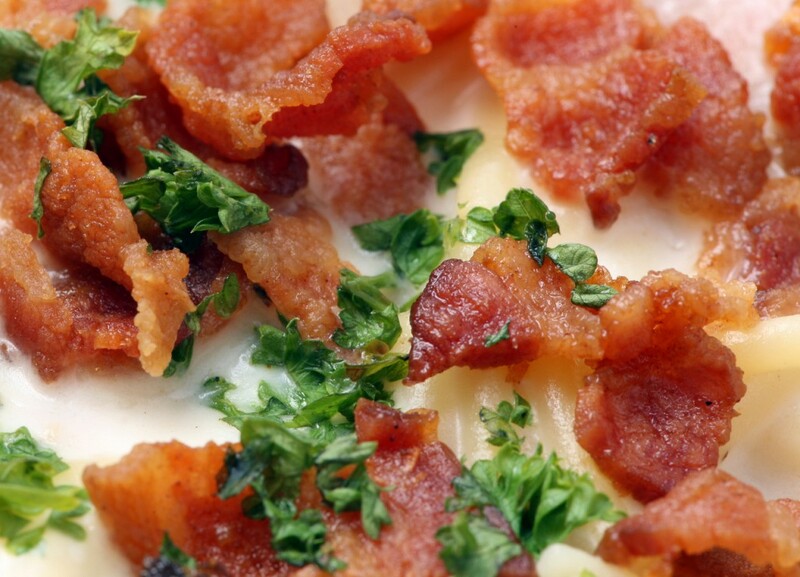 Because of the high fat content, bacon usually cuts just as well frozen as it does thawed. What is your favorite kind of bacon? Do you have tips for buying & storing it that you would like to share? Share them in the comments, or show me on social media – @foodabovegold. Make sure to tag it #CallMeMichelin so everyone sees how this post helped you out! 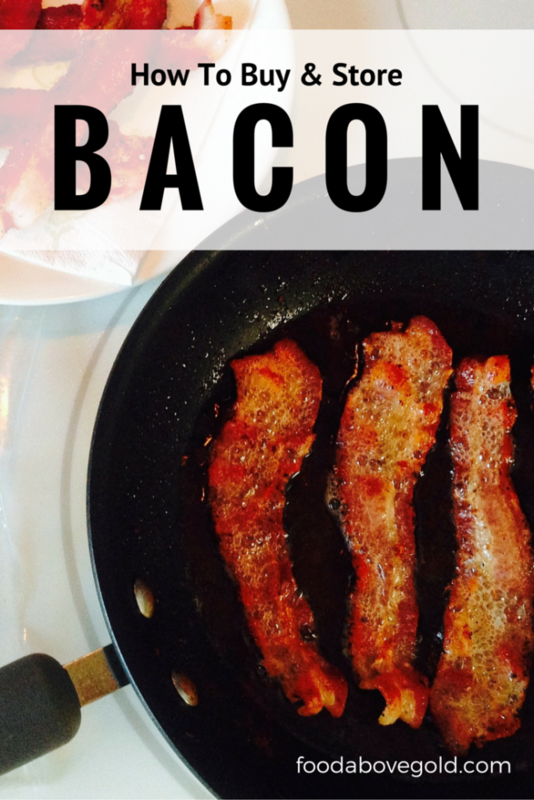 I’m a huge fan of bacon and have been wondering what I should look for, to make sure I get the best bacon. You wrote in your article that thickness is important and that a regular thick-cut is about 1/8″ thick. I’ll have to find a supplier that has thick cut, quality bacon as that is exactly the kind of meat I am looking for.